Asked by Boat International to pick their top events of the Caribbean circuit, the North Sails team picked the following not-to-be-missed regattas... 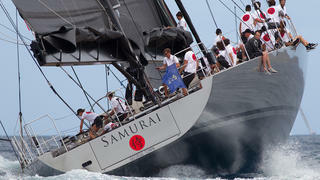 The Superyacht Cup in Antigua is a top pick for the spring racing season. Antigua’s relaxed atmosphere and consistently fantastic sailing conditions are an unbeatable combination found at this yearly event. Set in the glassy shores of historic English Harbour, a tight group of superyachts are moored in a flat calm basin taking part in fantastic coastal racing. This year sailors reported typical conditions of steady trade winds and 7ft seas. Their advice? Sail towards the land for current relief and advantageous shifts, the courses repeat themselves but the tactics certainly change. 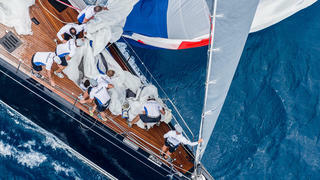 The Superyacht Cup in Antigua is a top pick for the spring racing season. Antigua’s relaxed atmosphere and consistently fantastic sailing conditions are an unbeatable combination found at this yearly event. Set in the glassy shores of historic English Harbour, a tight group of superyachts are moored in a flat calm basin taking part in fantastic coastal racing. This year sailors reported typical conditions of steady trade winds and 7ft seas. Their advice? Sail towards the land for current relief and advantageous shifts, the courses repeat themselves but the tactics certainly change. 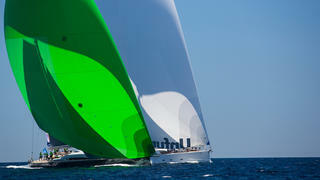 The Rolex Swan Cup Caribbean is held at the beautiful Yacht Club Costa Smeralda clubhouse in Virgin Gorda. It brings together the unique Nautor's Swan family of yachts from 11-35 metres. This year will feature the Finnish design house’s new one-design yacht, the ClubSwan 50, a self-professed “small revolution” in performance and pure sailing pleasure. The newly competitive fleet will join 20 other boats for the biennial event in March, where they will race around Virgin Gorda amidst breathtaking scenery, including islands that rise out of the ocean with steep elevation. After racing the club throws a great party, always with its trademark Italian flair. This is a really vibrant sailing week with a range of boats and competitors, similar in many ways to Les Voiles de St Barths. 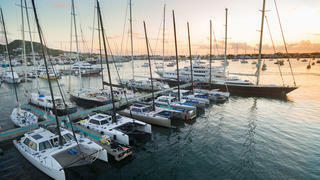 Yet the thing about St. Maarten is while there is the IRC racing, the island’s foundation of charter boats adds a fresh flair and crowds from Europe and beyond travel down to race in a dedicated no-spinnaker fleet. And the Heineken Regatta wins the party, hands down, every year. The event draws big bands to a main stage to provide a really great social vibe. Couple that with a fun racing scene, and you’ve got an event that stands alone in the Caribbean series — a little bit different to the pure Superyacht events. It’s a classic many consider a right of passage to having really experienced all that the Caribbean circuit has to offer. 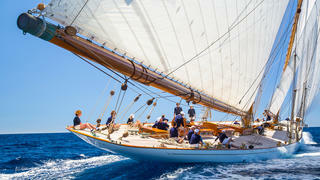 A firm favourite amongst the Superyacht team, this regatta is another classic on the circuit. Organised by Boat International Media and the Yacht Club Costa Smeralda, the Loro Piana Caribbean Superyacht Regatta is a very family-friendly event aimed at competitive racing but also an opportunity to experience, and enjoy the beautiful British Virgin Islands. Held the weekend after the Swan Cup —many of the same boats triple the fun by racing in this and the Bucket as well. While the courses are similar to the Swan Cup, the legs are shorter and the boats are, on average, bigger, putting a lot of pressure on crew work. One example is the 44 metre Samurai, with roughly 20 people working the deck, every tack, gybe and sail change goes off without a hitch (at least that’s the idea!). Over the years, many of the world’s best sailors and boats have converged on St Barths to take part in the Bucket. What started as a laid-back event where yacht captains would challenge each other “around the island”, is now a multinational event run under ORCSY —a racing rule modelled after this very event. Now a professionally run regatta with plenty of demand, the Bucket reaches its maximum of 40 boats every year. St Barths is a French island known for its “unspoiled” nature, and the Bucket remains true to its roots in beautiful, pure, enjoyable sailing. North Sails brings an added layer of support to this event with a pop-up Certified Service™ loft. The loft team often works all hours of the night to mend sails before the next day’s racing. Over the years, many of the world’s best sailors and boats have converged on St Barths to take part in the Bucket. What started as a laid-back event where yacht captains would challenge each other “around the island”, is now a multinational event run under ORCSY —a racing rule modelled after this very event. Now a professionally run regatta with plenty of demand, the Bucket reaches its maximum of 40 boats every year. St Barths is a French island known for its “unspoiled” nature, and the Bucket remains true to its roots in beautiful, pure, enjoyable sailing. North Sails brings an added layer of support to this event with a pop-up Certified Service™ loft. The loft team often works all hours of the night to mend sails before the next day’s racing. Billed as one of the Caribbean's great sailing meets, its inaugural event in 2010 laid the groundwork for an ever-growing number of competitors. Those that get to be part of it have come back year after year. As an IRC event, Les Voiles de St Barths welcomes a wide range of boats — everything from Melges 24s, Mini Maxi 72s, TP52s, to a few superyachts. Racing is run by a local team over four days. North Sails experts again enjoy sailing in the consistent, unobstructed tradewinds that travel all the way from Europe, rolling in on waves from the open ocean. 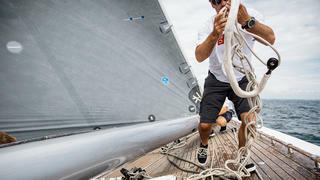 North Sails brings an added layer of support to this event too (as well as the St Barths Bucket) with a pop-up Certified Service™ loft to fix sails and ensure everyone is on the water, ready for racing each day. Billed as one of the Caribbean's great sailing meets, its inaugural event in 2010 laid the groundwork for an ever-growing number of competitors. Those that get to be part of it have come back year after year. As an IRC event, Les Voiles de St Barths welcomes a wide range of boats — everything from Melges 24s, Mini Maxi 72s, TP52s, to a few superyachts. Racing is run by a local team over four days. North Sails experts again enjoy sailing in the consistent, unobstructed tradewinds that travel all the way from Europe, rolling in on waves from the open ocean. 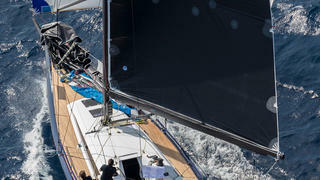 North Sails brings an added layer of support to this event too (as well as the St Barths Bucket) with a pop-up Certified Service™ loft to fix sails and ensure everyone is on the water, ready for racing each day. The Antigua Classic Regatta is run out of the Antigua Yacht Club. This event is a mix of both the Classic and Spirit of Tradition yachts from 45 metre schooners to 9 metre Carriacou sloops. It brings together some of the world's most celebrated and admired boats to line up together with a backdrop of glassy blue sea and almost perfect winds. In such a beautiful setting, the fun, laidback atmosphere is hardly surprising. Less known in mainstream yachting circles is the Yoles Rondes racing in the French island of Martinique. The Yole is a 11 metre wooden canoe-hulled boat with a long shallow straight keel. The mast remains a tree trunk cut from the rain forest and the spirit is made from bamboo. The sails vary in size from 35 to 82 metres square depending upon the wind. The crew number can be up to 14, changing during each race, and they all balance far out beyond the hull on wooden posts that are moved from side to side with each tack. The boat has no rudder but is controlled by a 3 metre long paddle. 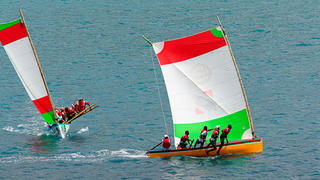 It is a beautiful, traditional showcase of Caribbean heritage and culture which cannot be matched by any other regatta.